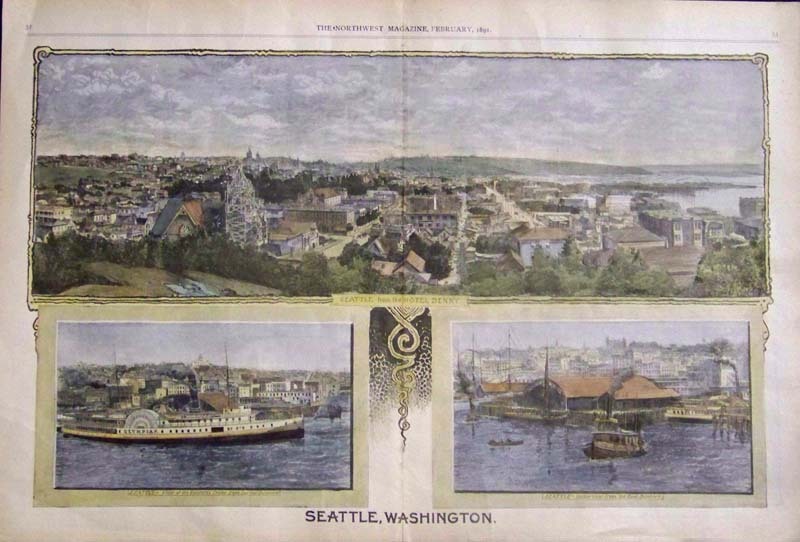 Antique Washington Prints and Maps for sale. 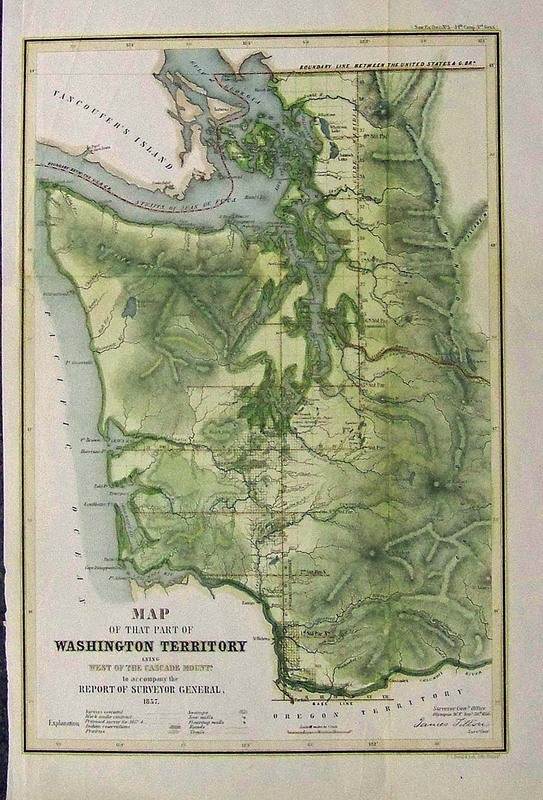 1855 Rare Map of a Part of the Territory of Washington to Accompany Report of Surveyor General. Hand colored lithographed map by James Tilton, Surveyor General. 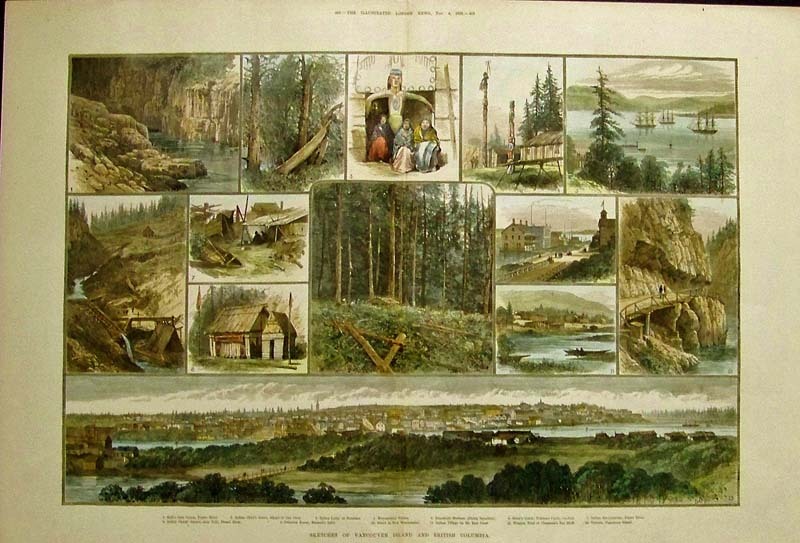 1886 Scarce Mountain Mines of Washington. Titled "A Lady's Camping Tour in the Far, Far West." 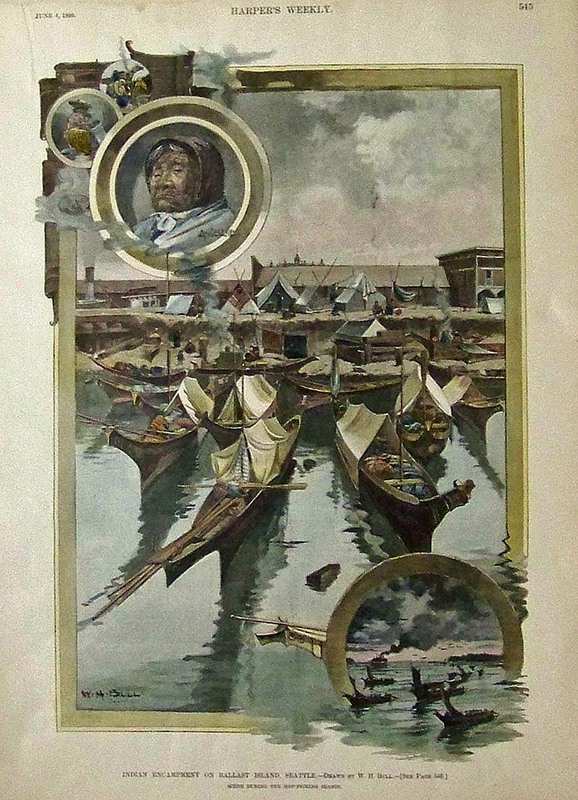 Five delightful hand colored views by a London publisher. 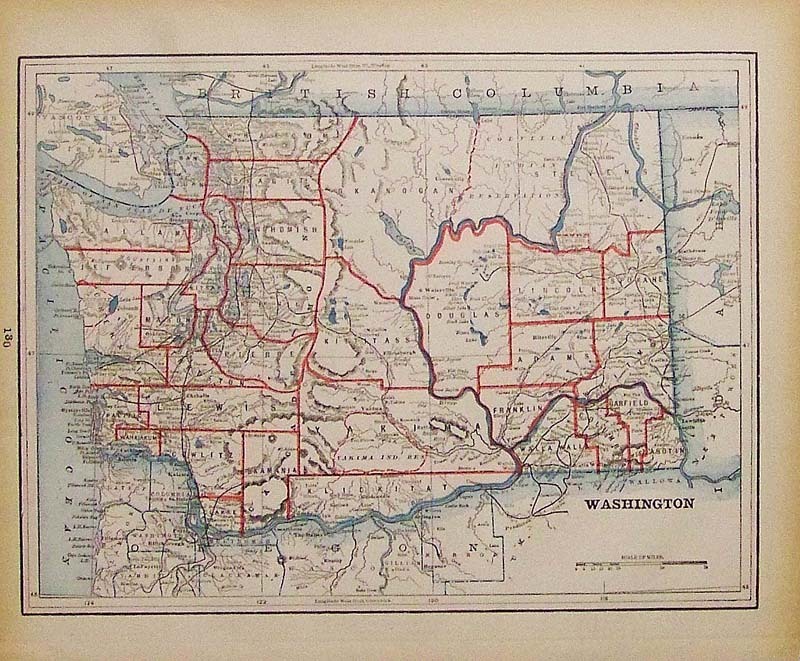 1892 Wheat Growing Map, Washington. Columbia River region. Population of cities and counties given, railroads in red. Great detail, printed in color by US Government. 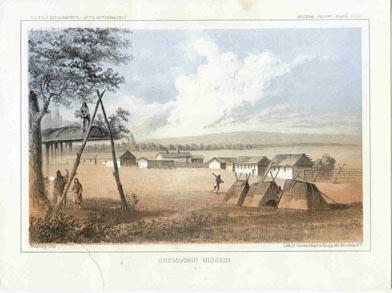 1855 Washington Chemakane Mission. Lithograph by US Government for possible railroad route at 47th-49th parallels. Color view shows Indian settlement. 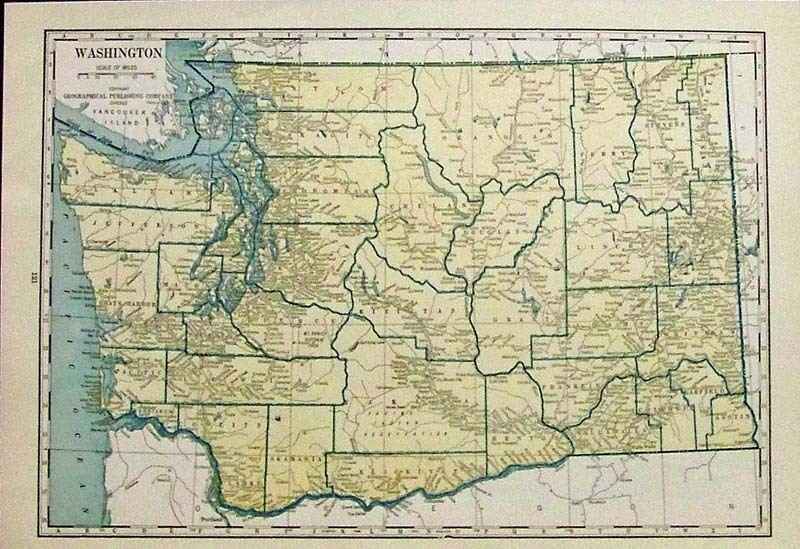 1873 Map of Washington, Oregon by Gray. Beautiful, hand colored map from Gray's 1873 world atlas. 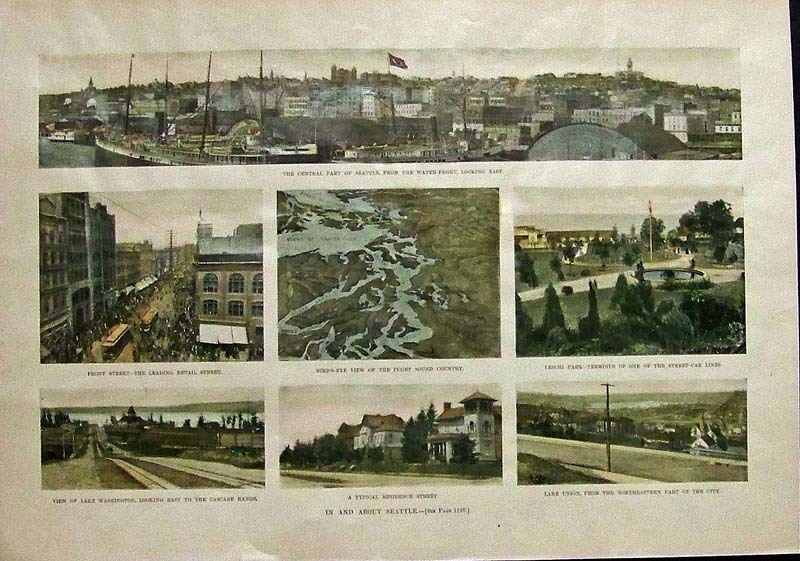 Shows cities, towns, railroad lines and geographical features. Each county is colored separately. 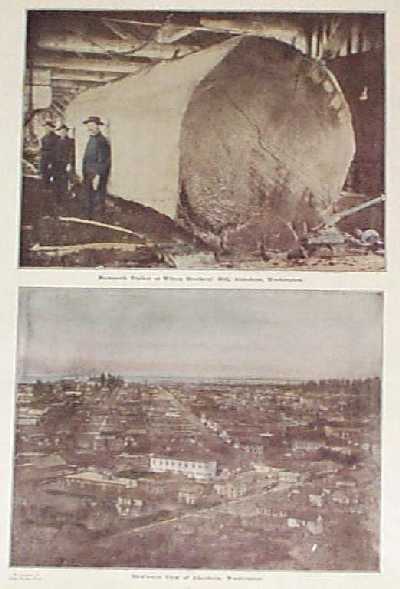 1909 Aberdeen Washington Scenes. 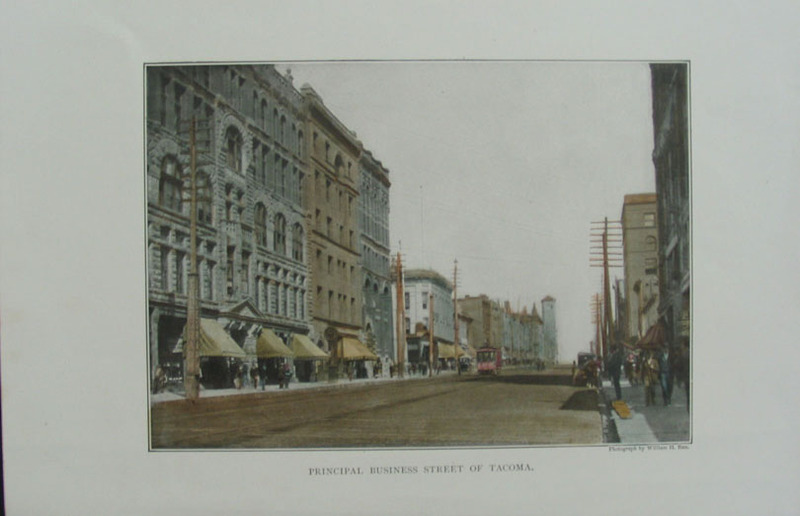 Two hand tinted rare photos from a 1909 publication, showing scenes in Aberdeen Washington. At top is a view of a mammoth log in an Aberdeen saw mill. At bottom is a bird's-eye view of the city. 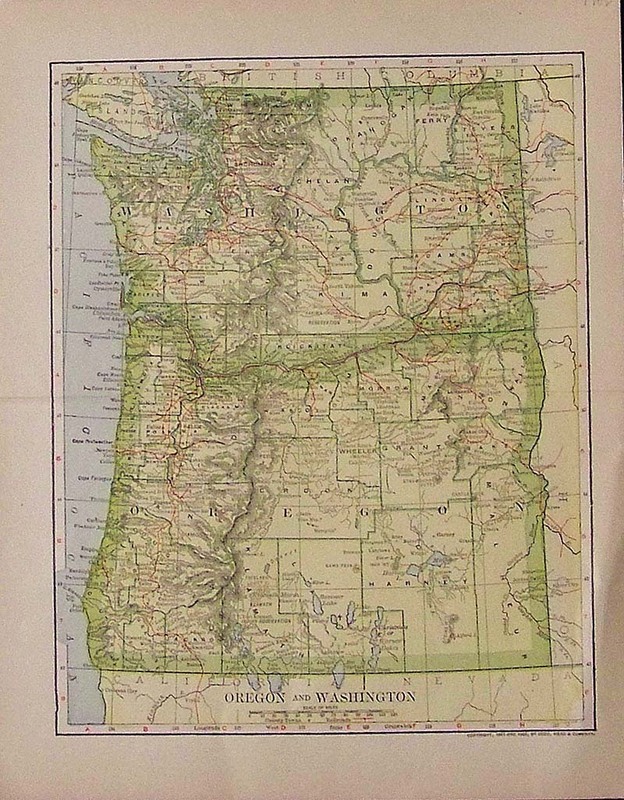 1902 Dodd, Mead & Company color map of Oregon and Washington. 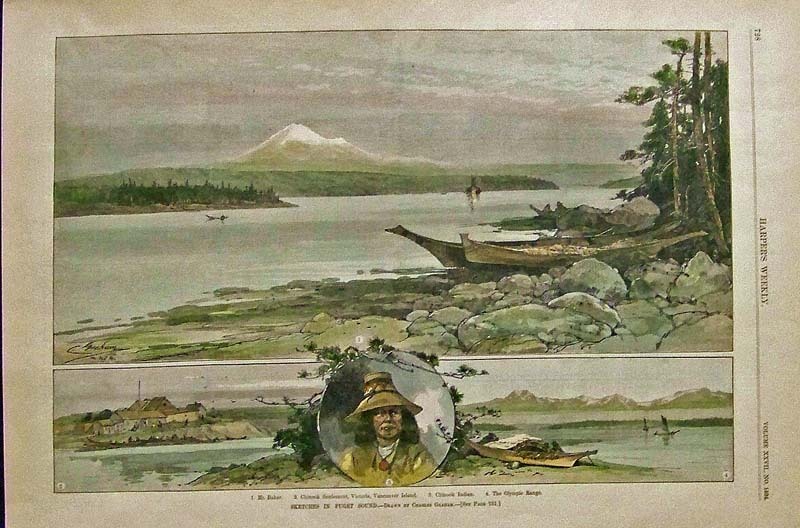 1882 Hand colored wood engraving showing Sketches of Vancouver Island and British Columbia. 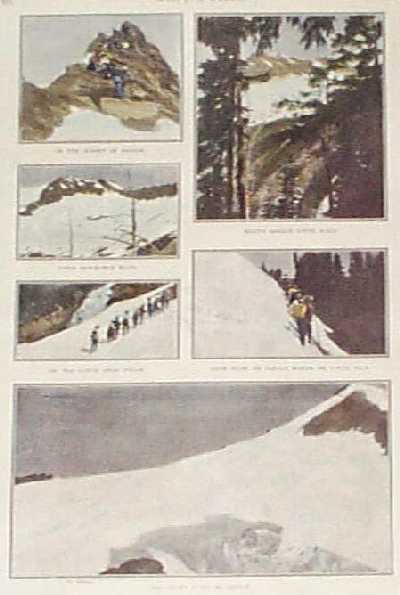 Featured in The Illustrated London News. 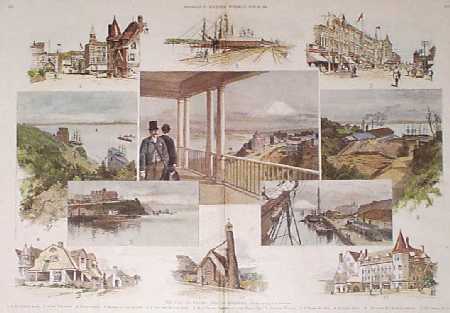 1855 Color lithographed US Pacific Railway and Expedition Survey's General Report - Plate XLIV titled Fort Vancouver, W.T. 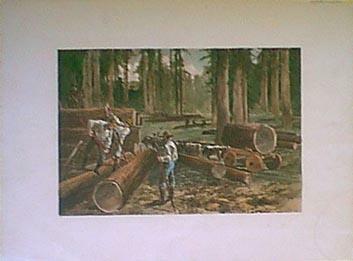 Lithographed by Sarony Major & Knapp. 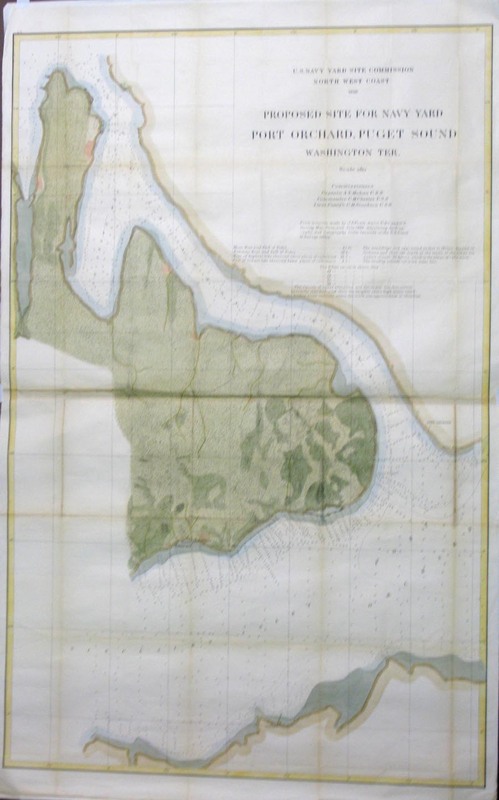 1855 Color lithographed USPRR Expedition & Survey's General Report with information sheet on the Survey for a Railroad Route showing the Hudson Bay Mill. 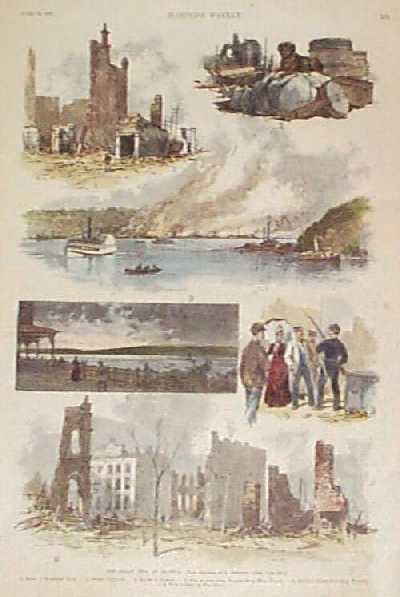 Lithographed by Sarony, Major & Knapp. 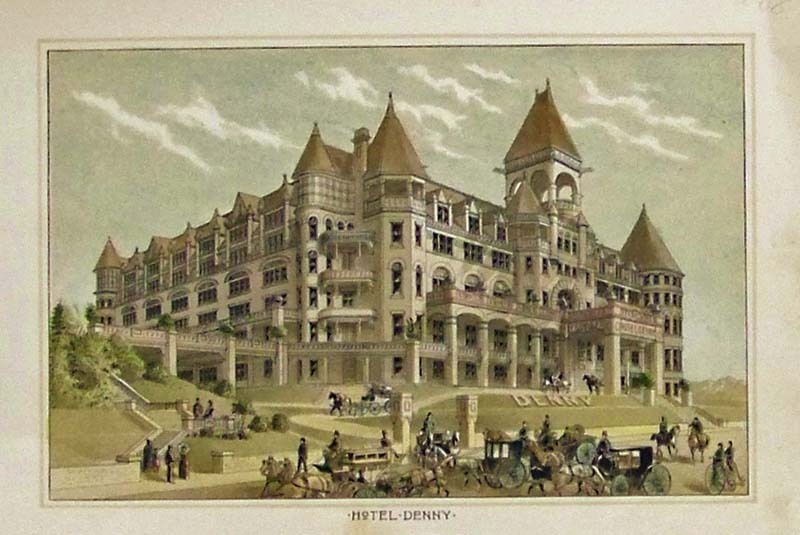 1888 Color half-tone showing the magnificent Hotel Denny in Seattle. 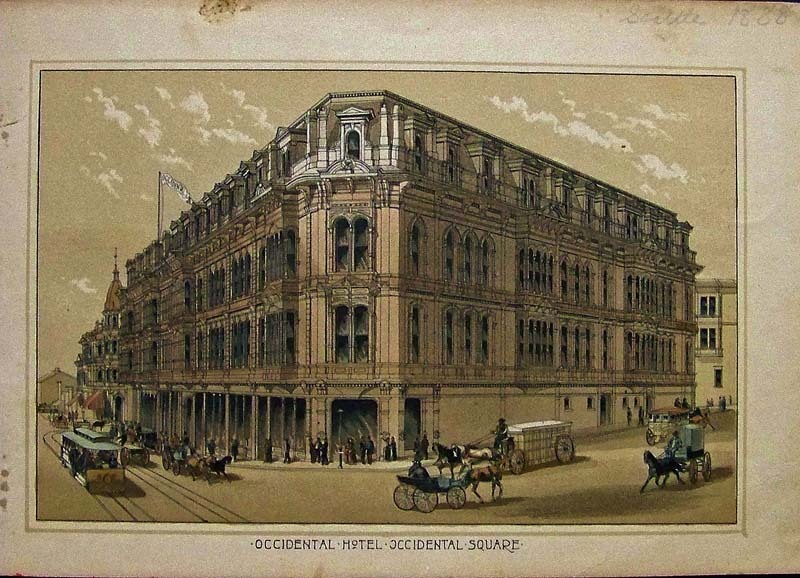 1888 Color half-tone showing the Occidental Hotel in Seattle in the Occidental Square. 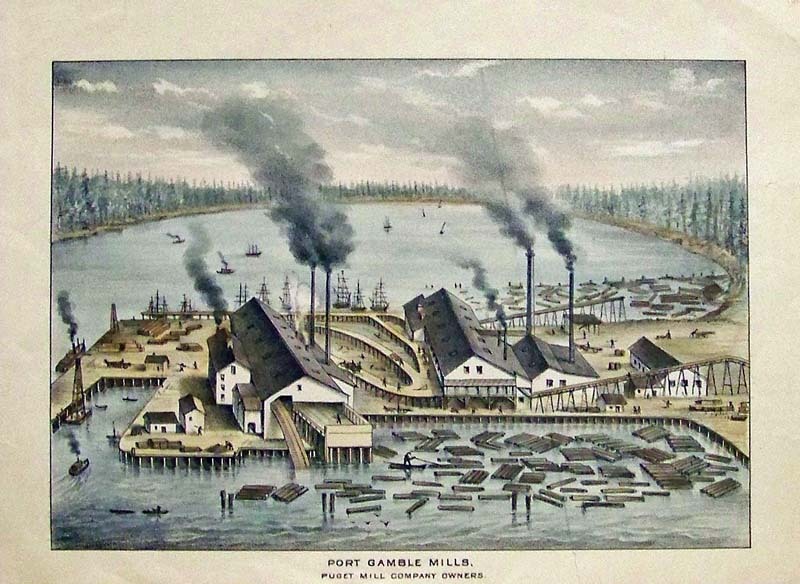 C.1880 Hand colored steel engraving showing Port Gamble Mills, the Puget Mill Company Owners. 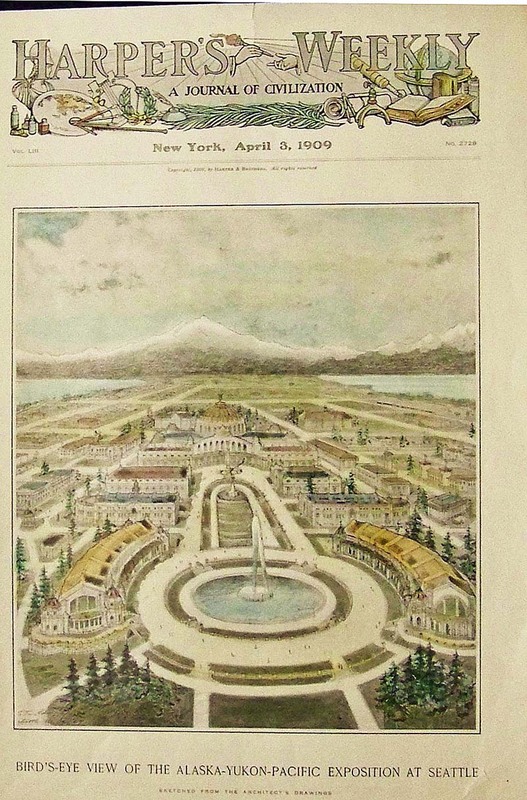 1909 Hand colored wood engraving showing a Bird's-Eye View of the Alaska-Yukon-Pacific Exposition at Seattle. Featured in Harper's Weekly, A Journal of Civilization. 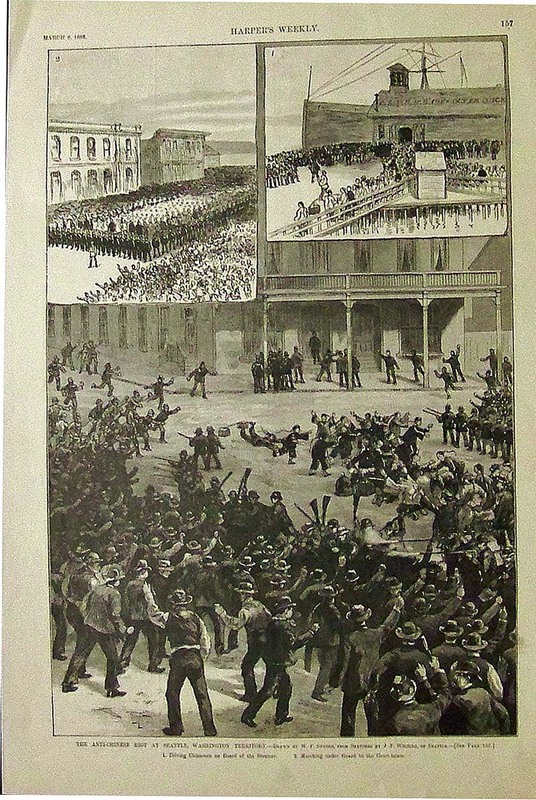 1886 Wood engraving from Harper's Weekly showing the Anti-Chinese Riot at Seattle, Washington Territory. Drawn by W.P. Snyder. 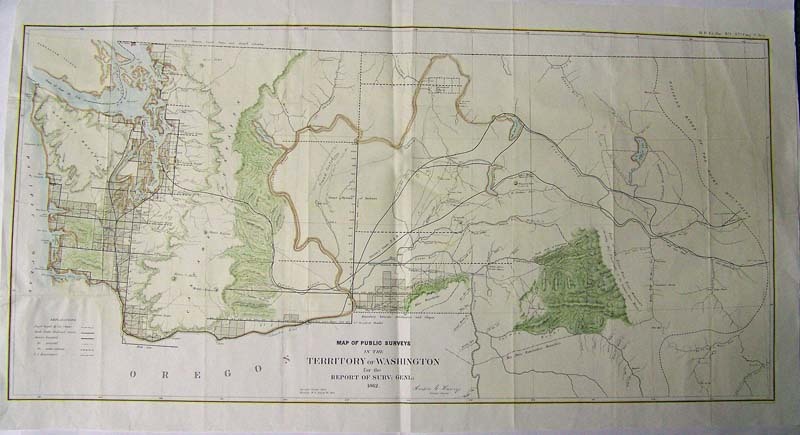 Map of a Part of Washington Territory Lying East of the Cascade Mountains, Tilton, 1857 - A lithographed map of a Part of Washington Territory Lying East of the Cascade Mountains to Accompany Report of Surveyor General. 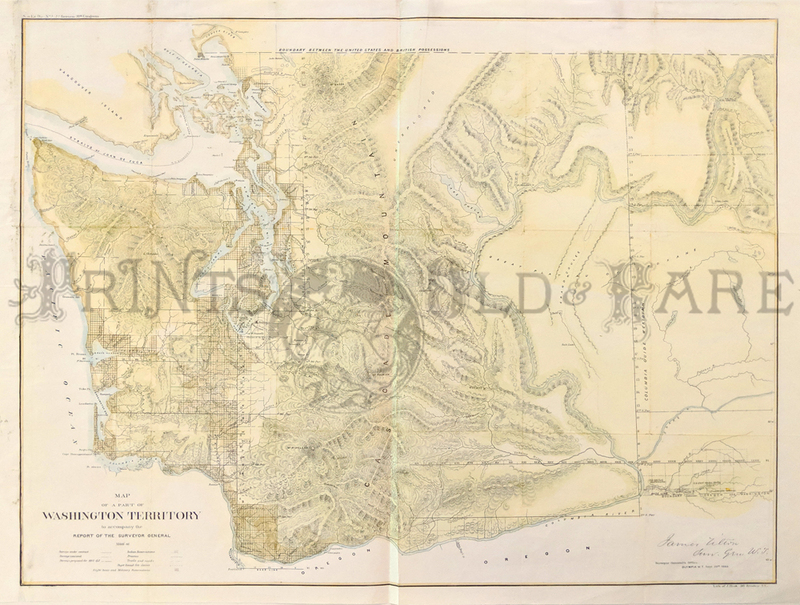 This uncommon and very detailed map covers the Columbia River from Ft. Dallas eastward to Ft. Walla-Walla, and north to Ft. Colvill. The "Great Plateau of Spokane" spans the center of the map. In the upper right corner, the "Gold Mines" are shown along the "Western limits of the Rock Mountains". Steven`s survey route for the Pacific Railroad, creeks, rivers, lakes, roads, the Old Presbyterian Mission are also shown along with Lake Chelan. The map was surveyed by Tilton and lithographed by C.B. Graham, Washington D.C., 1857. 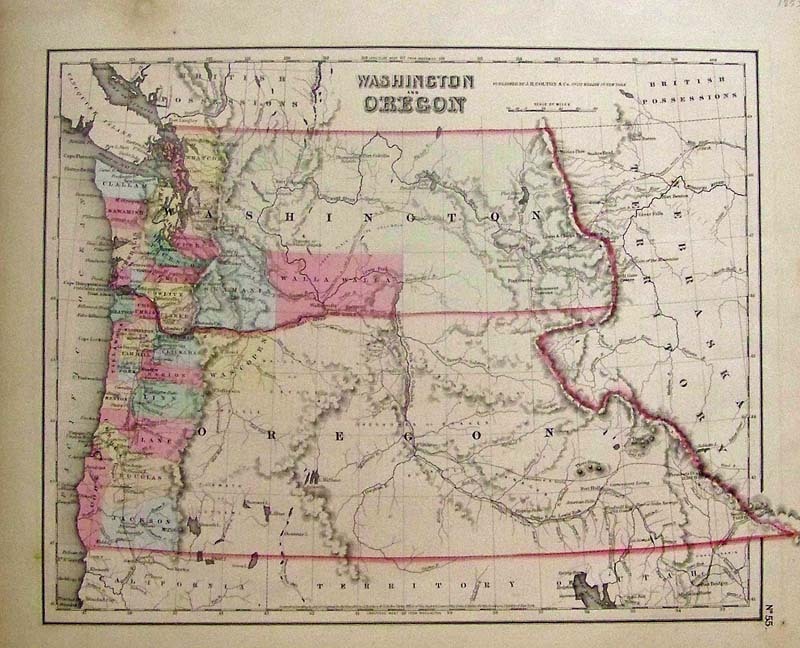 Washington and Oregon, Colton 1853 A very early and rare map of Washington and Oregon with original pastel coloring of newly formed counties in each state. Canada is British Possessions and Oregon and Washington extend into the states of Idaho, Montana, parts of Montana and Wyoming are shown as Nebraska Territory and California is also shown as a territory. Colton maps of this region exhibit dramatic changes from year to year, indicating actual changes in the expansion and settlement of the area. 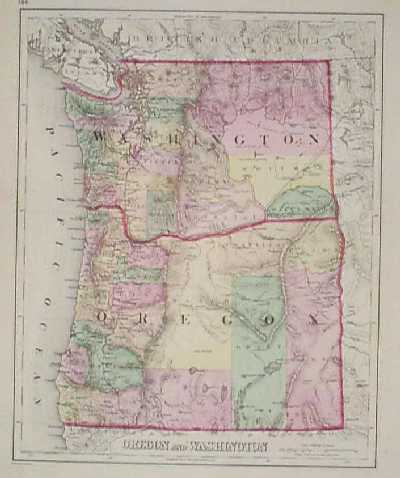 In this map Washington and Oregon extend fully to the Continental Divide where they encounter a Nebraska Territory that extends north all the way to Canada. 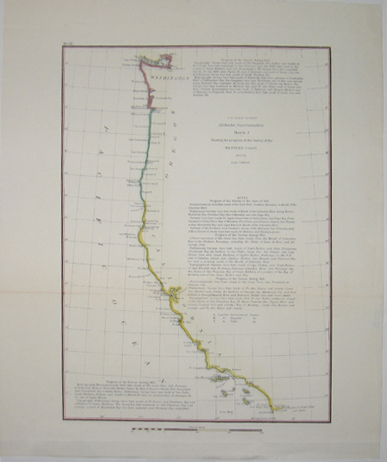 This map also shows the routes of early explorers including the proposed Stevens route of the Pacific Railroad. 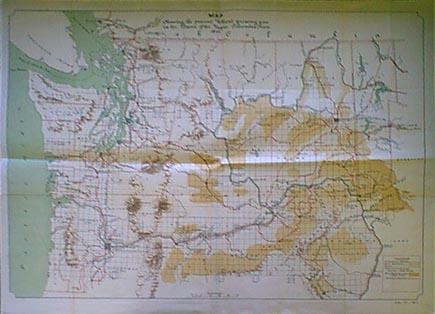 The map also shows Indian tribes, passes, and important forts. Dated and copyrighted: 'Entered according to the Act of Congress in the Year of 1853 by J. H. Colton & Co. in the Clerk's Office of the District Court of the United States for the Southern District of New York.' Published from Colton's 172 William Str. Office in New York City. Condition: Very good, typical aging and browning on the edges, wide margins, some water spots and foxing on margin edges. 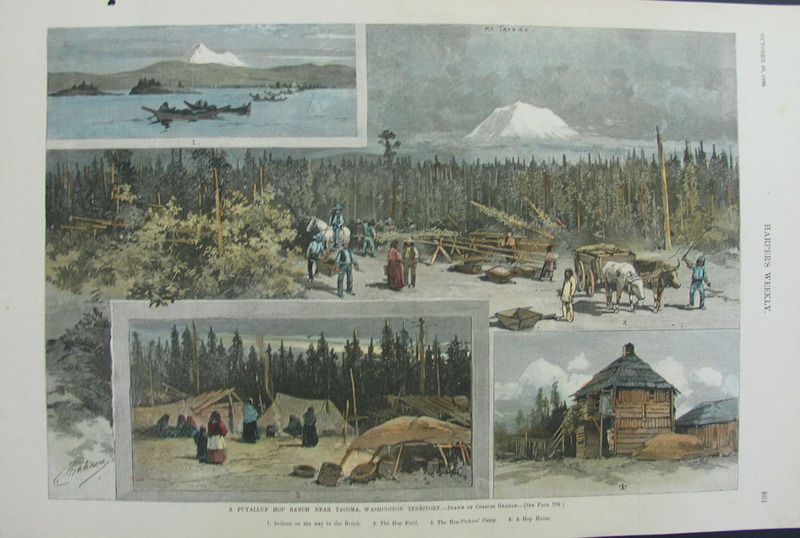 1892 Harper's Weekly hand colored wood engraving showing the Indian Encampment on Ballast Island in Seattle. Scene is shown during the hop-picking season. 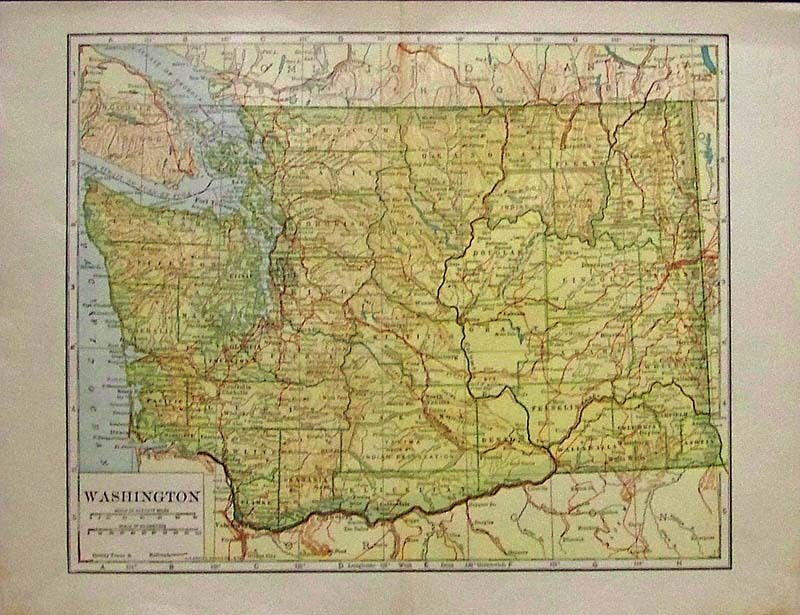 1932 Rand McNally color Standard Map of Washington featured in the Commercial Atlas. Index of its Principal Cities and another index sheet included. Small piece missing on side border bottom right. 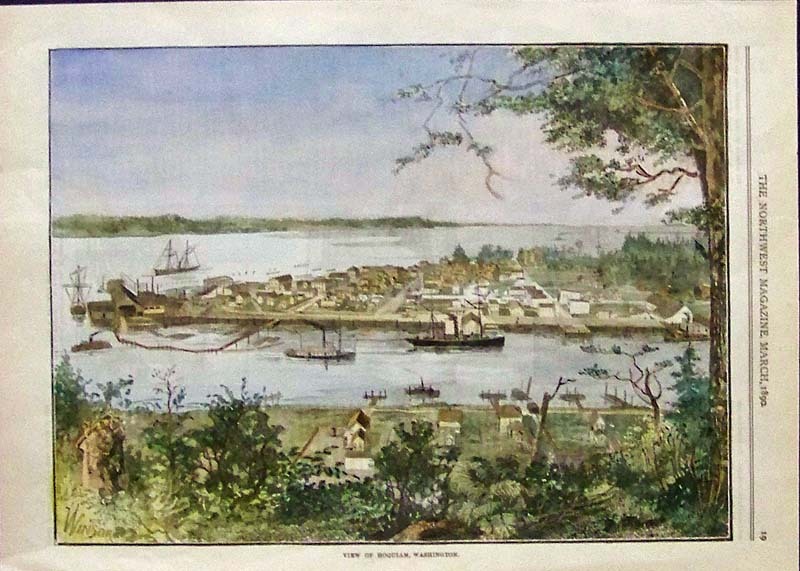 1890 Hand colored wood engraving featured in The Northwest Magazine showing a View of Hoquiam, Washington. 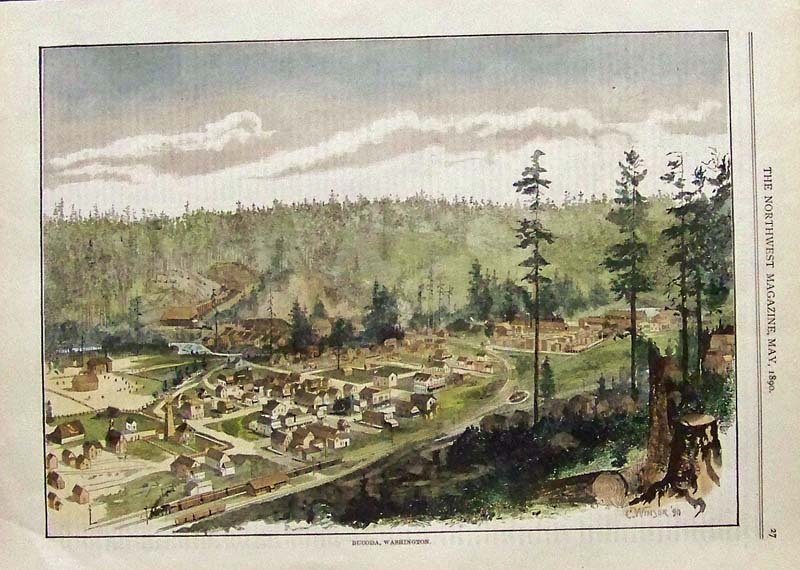 1890 Hand colored wood engraving featured in The Northwest Magazine showing Bucoda, Washington. 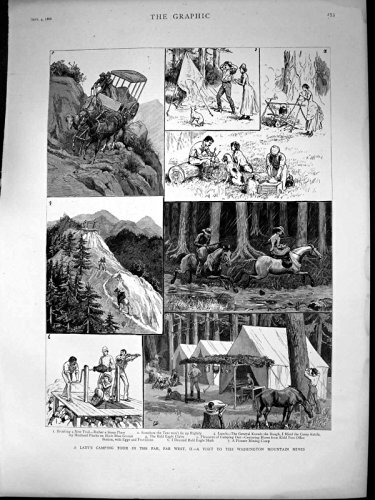 1890 Scenes in Spokane Washington. 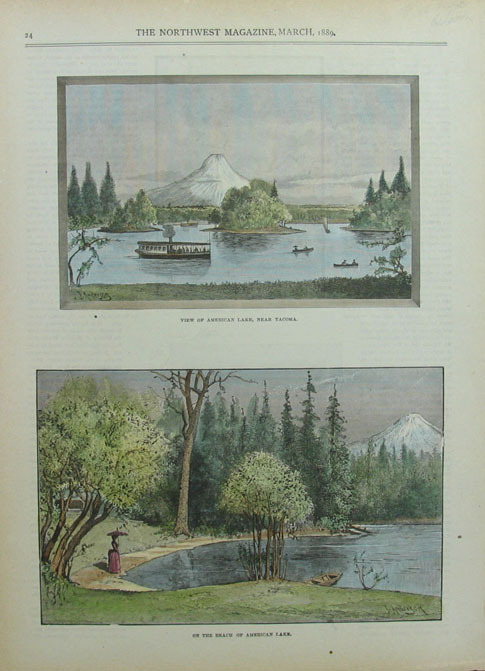 Nine hand-colored, antique engraved scenes from the Sept. 6, 1890 issue of Harper's Weekly. 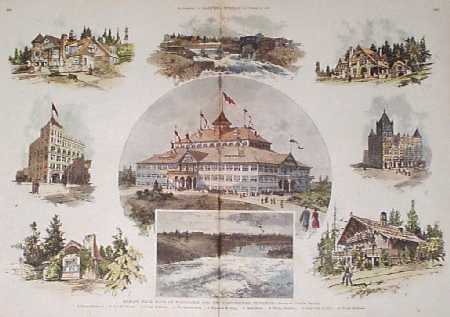 Title is "Spokane Falls, State of Washington, and the Northwestern Exposition. Center image shows the exterior of the Exposition building. Smaller scenes on the sides show individual landmarks around the city. 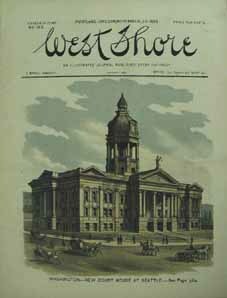 Very nice cover from the November 30, 1889 issue of West Shore. Color lithograph showing the New Court House at Seattle. 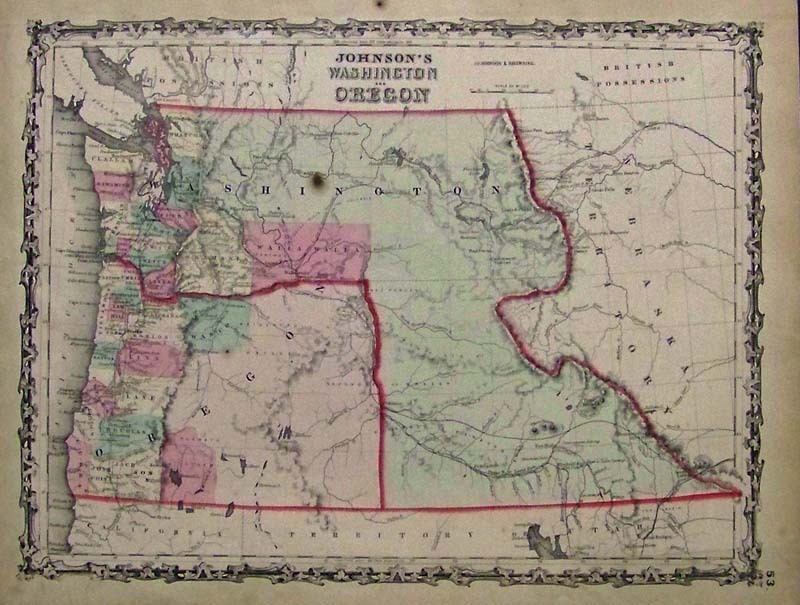 1851 A Diagram Of A Portion Of Oregon Territory map - Surveyor Generals Office, Oregon City on October 20, 1851 by John B. Preston, Surveyor General. Diagram shows which towns are propsed to be surveyed in A.D. 1852. 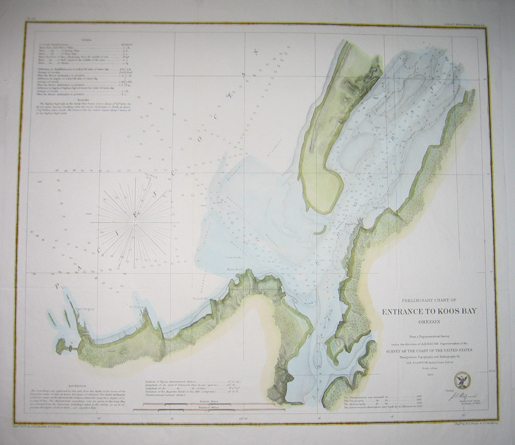 1862 Preliminary Chart of Gray's Harbor, Washington Ter. 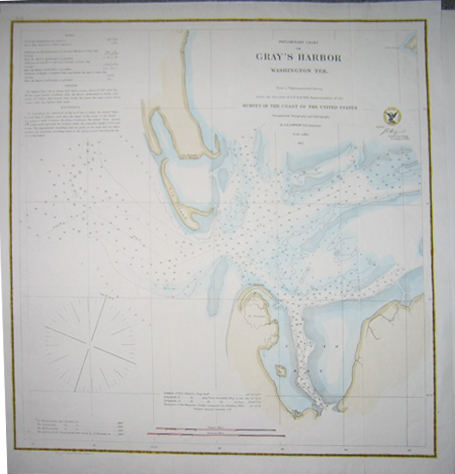 depicts the tides and soundings of Gray's Harbor. Excellent condition. 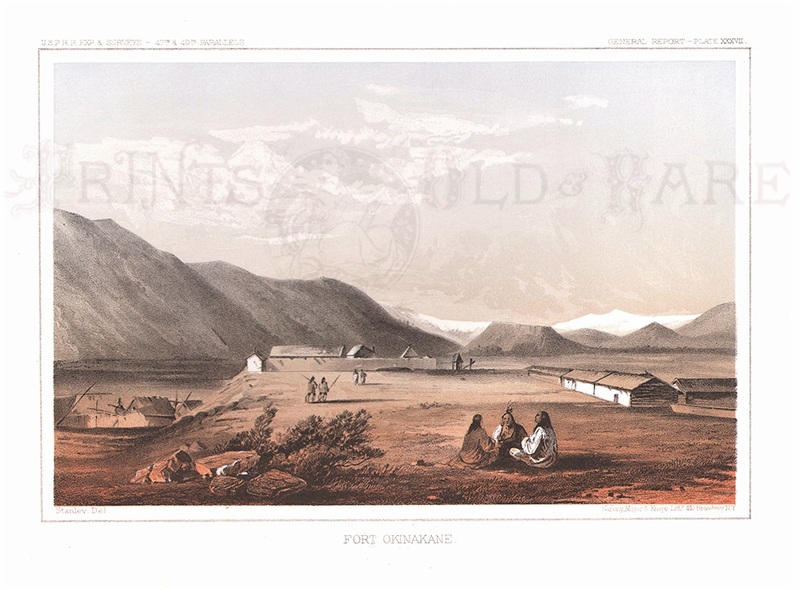 1855 Rare color lithograph showing early Western Fort Okinakane in an antique Railroad Expedition print. 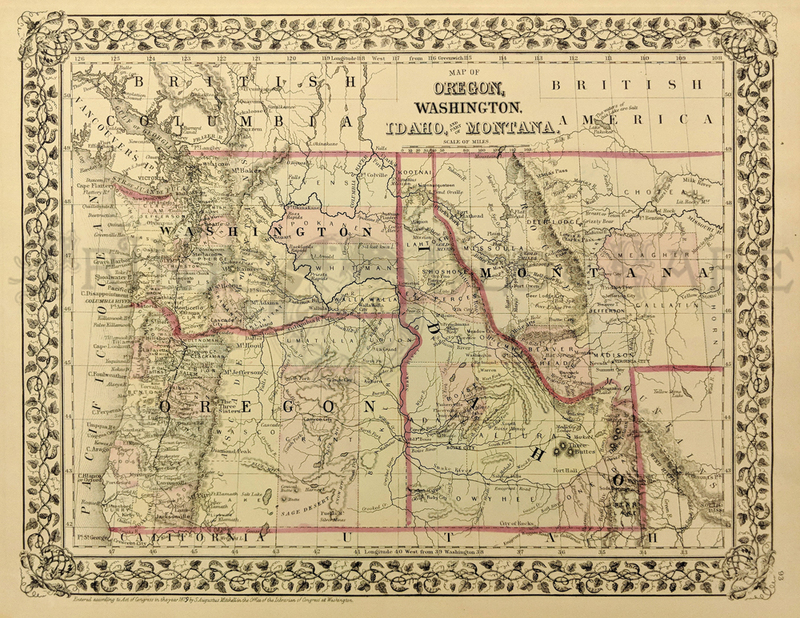 C.1860 Johnson's Washington, Oregon and Idaho hand colored engraved map. J.H. 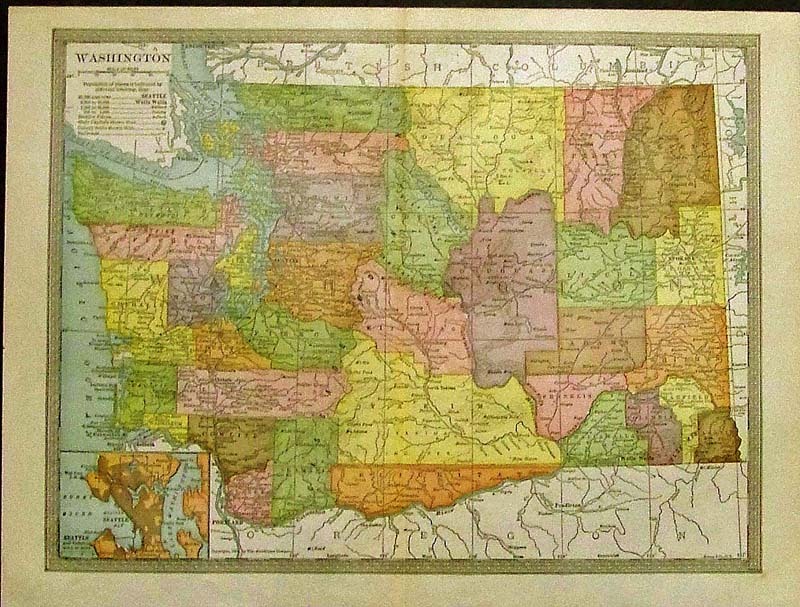 Colton original hand colored engraved map showing Washington and Oregon. Colton was among the earliest map makers with very accurate maps depicting cities and states in the United States. 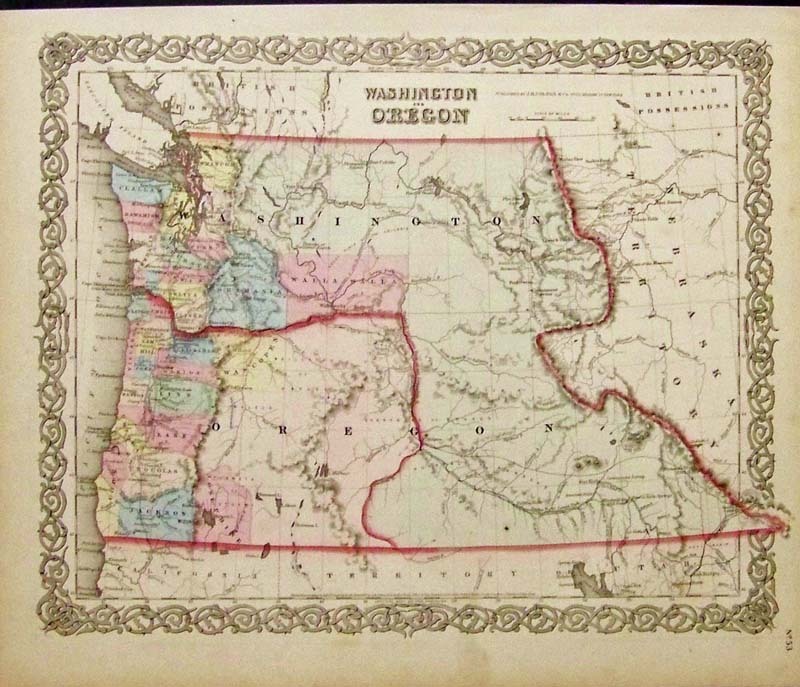 Oregon Territory 1852. 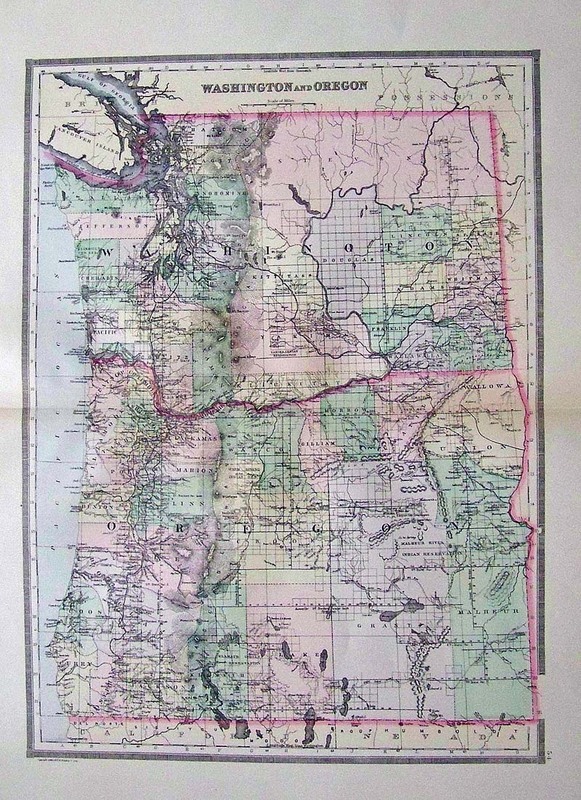 A nicely hand colored Oregon Land Survey Map published by the General Land Office in 1852 and surveyed by John B. Preston. Showing Oregon State and moving North to Washington, Puget Sound then stopping at Vancouver Island. A finely detailed map with mountains, rivers, townships and marks notable cities such as Salem, Oregon City, Astoria and Olympia. A scarce map. 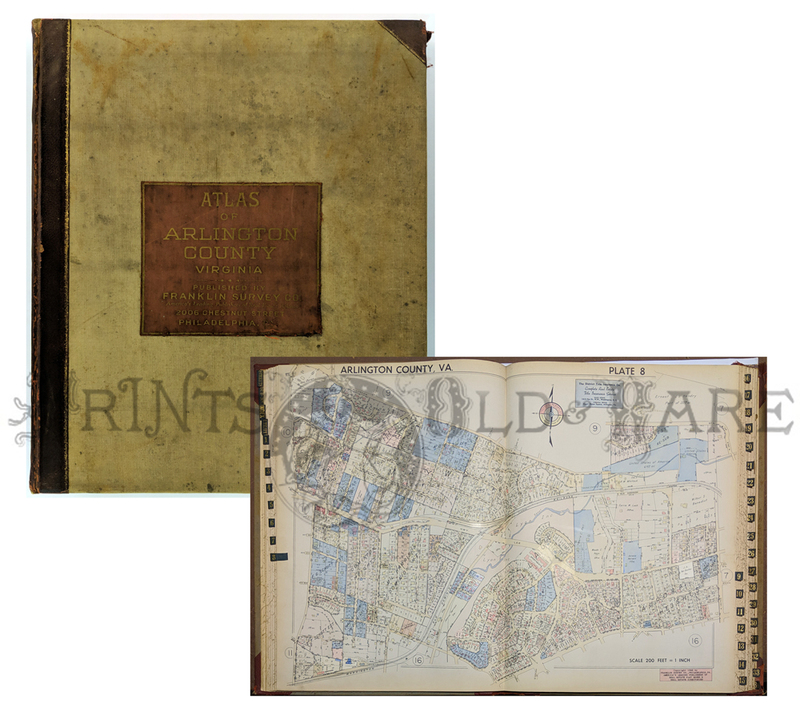 PLAT Book of Arlington County, Va. 36 Compiled from official records, private plans and actual surveys by Franklin Survey Co. Philadelphia 1943. Includes index & utility maps. All in color & linen back. Elephant Folio. Each map measures 21 x 30 in. 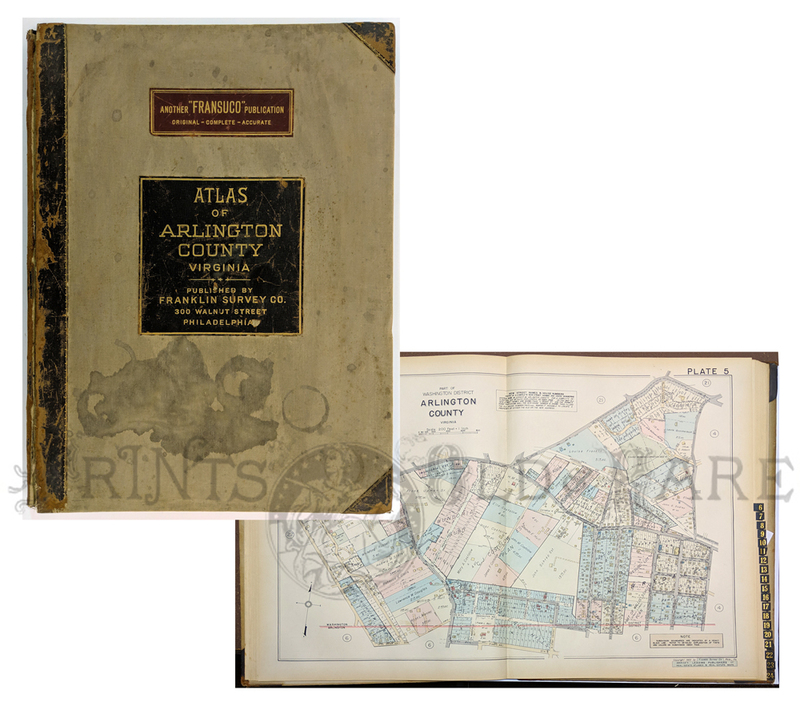 Atlas of Arlington County, Va. 1935. 26 colored maps including index and zone maps. Shows buildings, roads owners. Also has index of subdivisions. Elephant folio. Franklin Survey Co. Philadelphia. 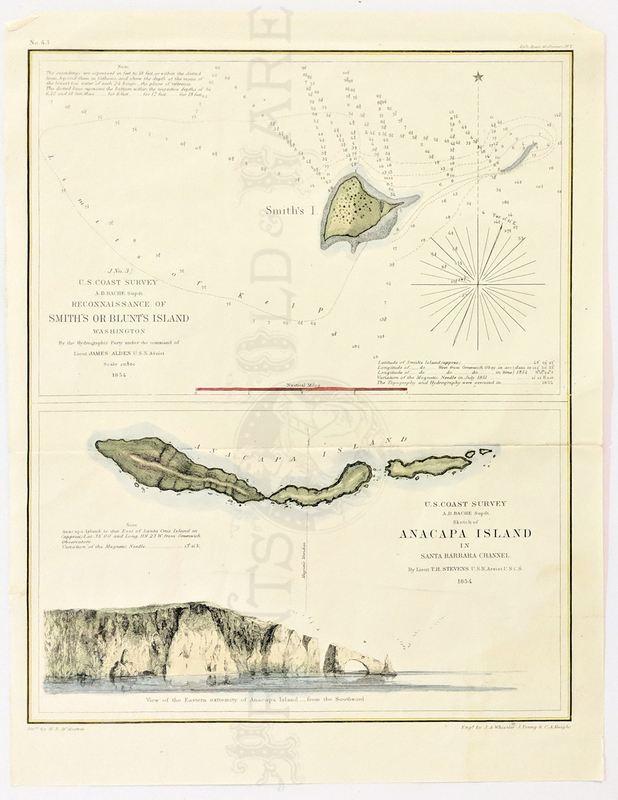 1854 Anacapa Island. Santa Barbra Channel and Smith OR Blunts Island (Washington). This Channel Island was drawn by famous artist James McNeil Whistler. 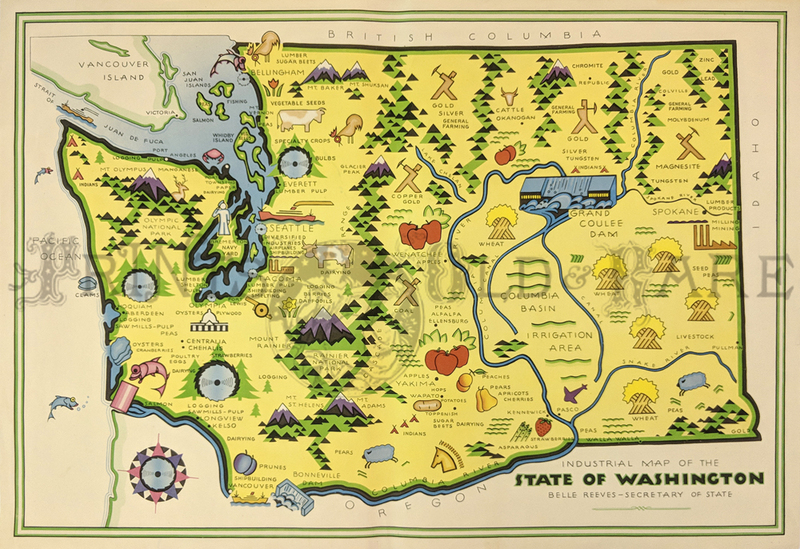 1926 Road Map – Washington State drawn by A.P. Neyhart. Shows oil, paved, gravel, dirt & uncompleted roads and counties -AAA. Original folds. Excellent condition. Verso: Mileage table, ferry and traffic information. Printed in color. 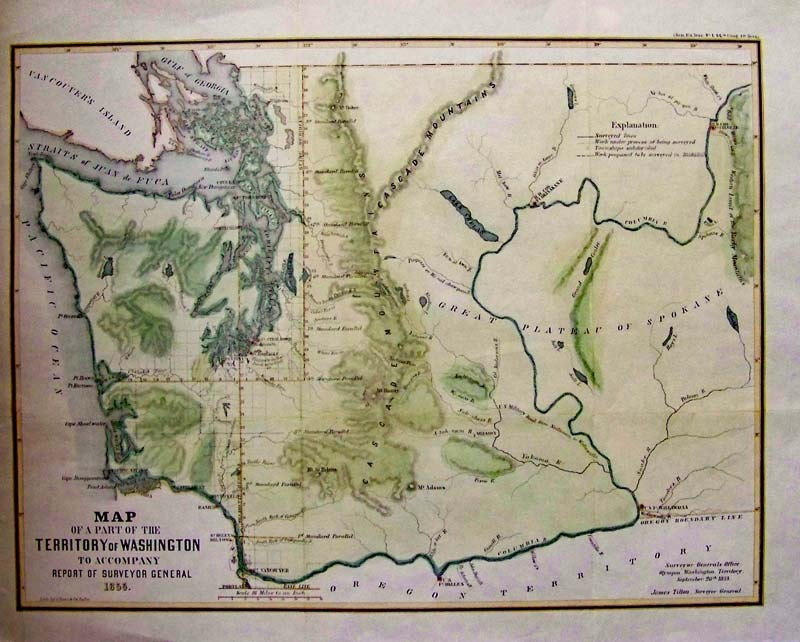 Map of That Part of Washington Territory Lying West of the Cascade Mountains, 1857 - A detailed lithograph map with original hand coloring, one of the first General Land Office Surveys of the region East of the Cascades, with great detail of today’s Puget Sound then the Admiralty Inlet. 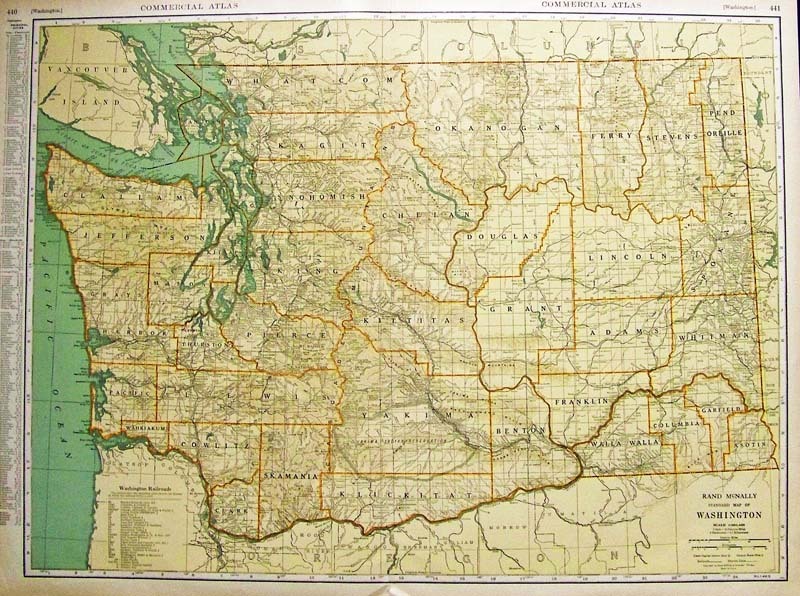 The map extends from the Columbia River to Canada. 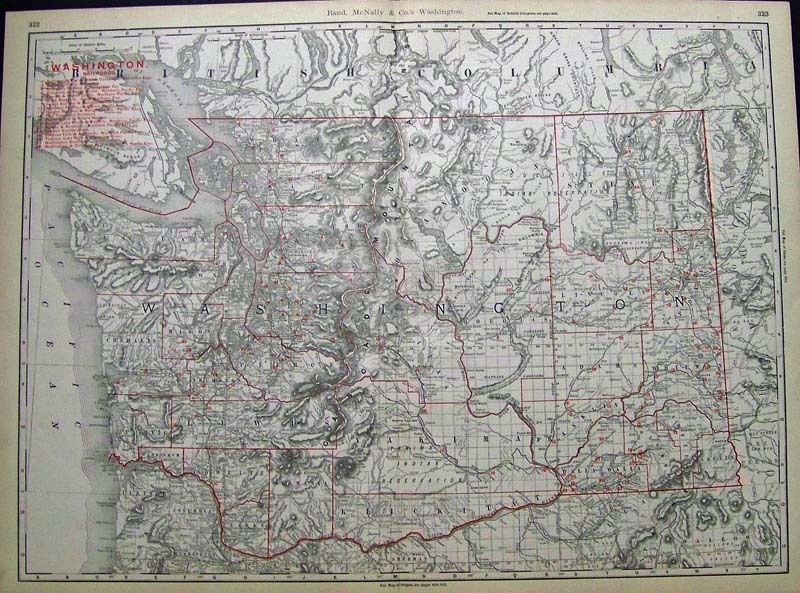 Shows Fort Dallas, Fort Walla Walla, the Presbyterian Mission on the Walla Walla River, Steven’s Route, the Military Road from Steilacoom to Walla Walla, Fort Simcoe, a Mission on the Atah-nam River, the Great Plateau of the Spokane, Fort Colvill and the Gold Mines to the North, Spokane House, and a host of other details. 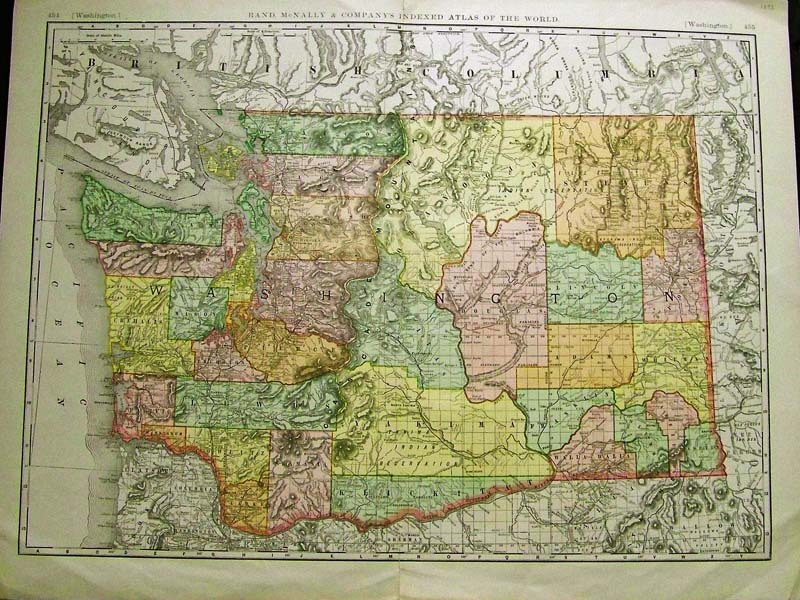 The earliest map to detail the region east of the Cascades, signed by James Tilton, Surveyor General, PS. Duval and Son’s Philadelphia. Condition: Very Good, small left margin, slight tear on top left margin and two small vertical folds. 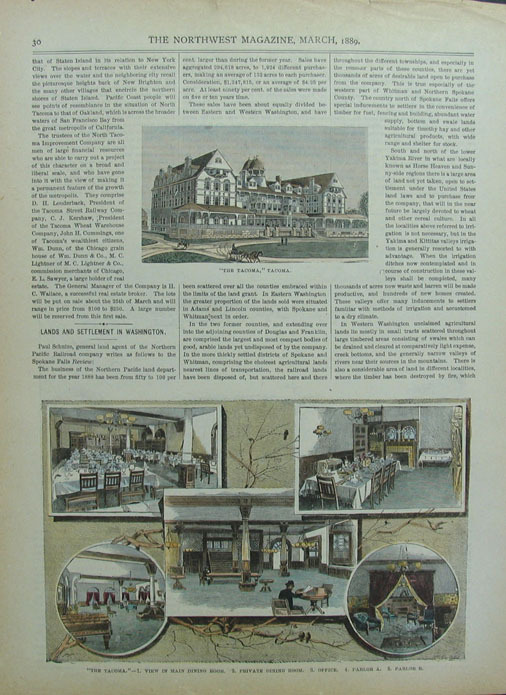 1888 Harper's Weekly "A Puyallup Hop Ranch Near Tacoma, Washington Territory"
The Northwest Magazine March 1889 "The Tacoma" view in the main dining room, private dining room, office, and parlor. 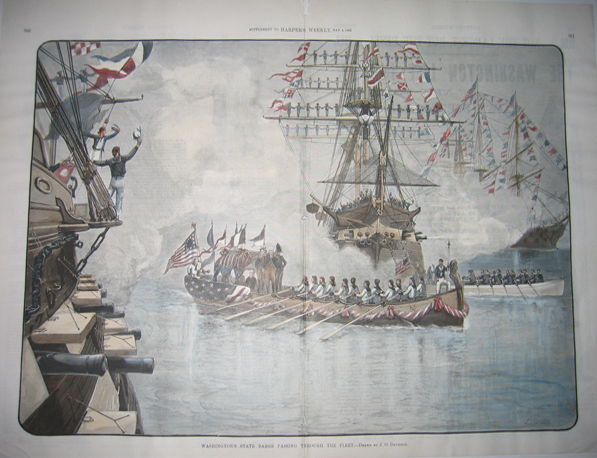 1866 Rare hand colored wood engraving featured in Harper's Weekly titled, "Emigration To Washington Territory Of Four Hundred Women On the Steamer (called) Continental." Sketched by A.R. Waud. 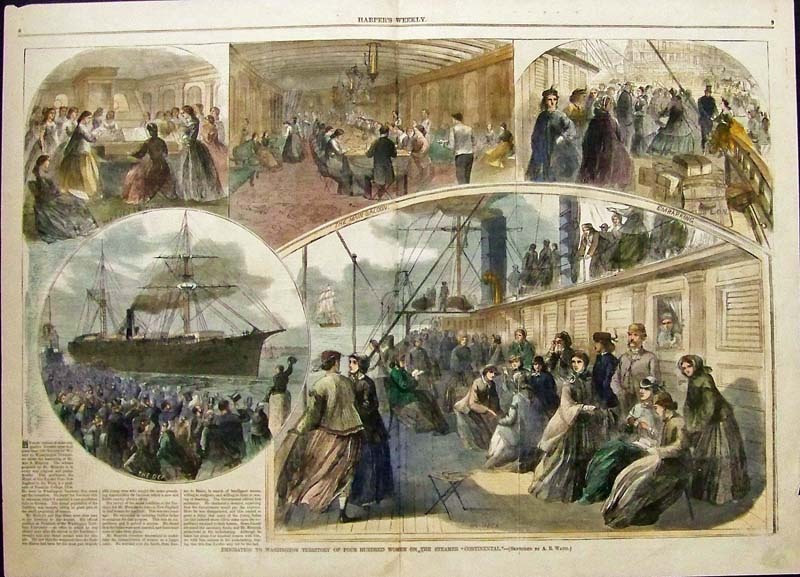 Five images shows women partaking of the Evening Hymn, The Departure, On Deck, The Main Saloon, and Embarking. 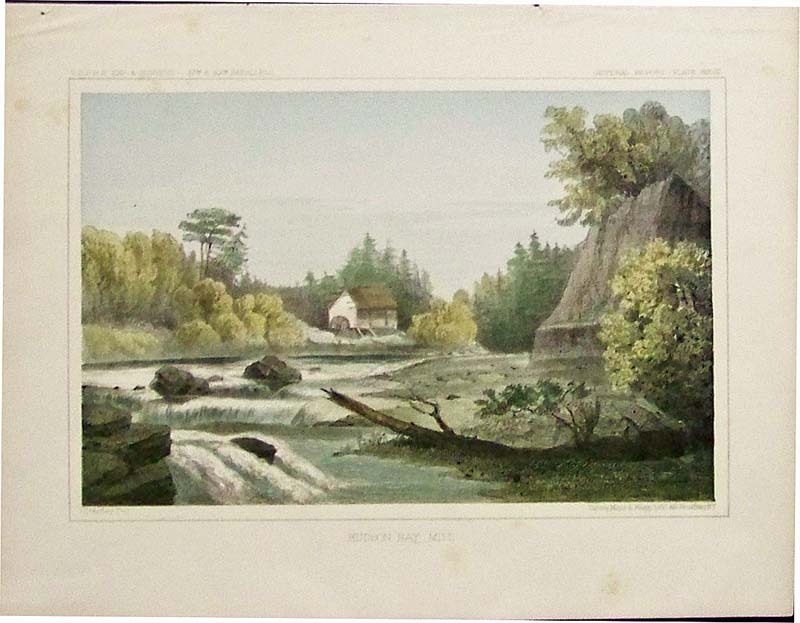 1855 Color lithograph titled, "Mt. Baker & Cascade Range From Whitby's Island." Sarony, Major & Knapp, Lithographers. Featured in the U.S.P.R.R. Expedition & Surveys. 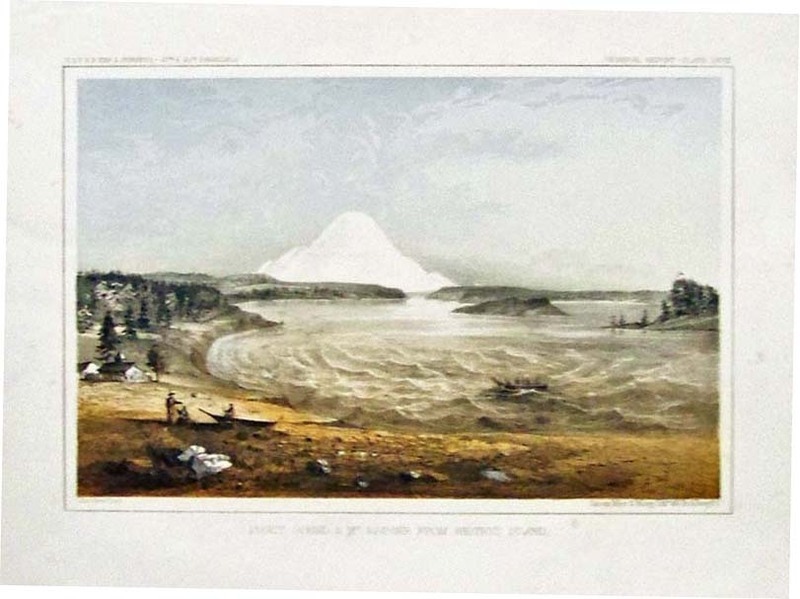 1855 Color lithograph titled, "Puget Sound & Mt. Rainier From Whitby's Island." Sarony, Major & Knapp, Lithographers. Featured in the U.S.P.R.R. Expedition & Surveys. 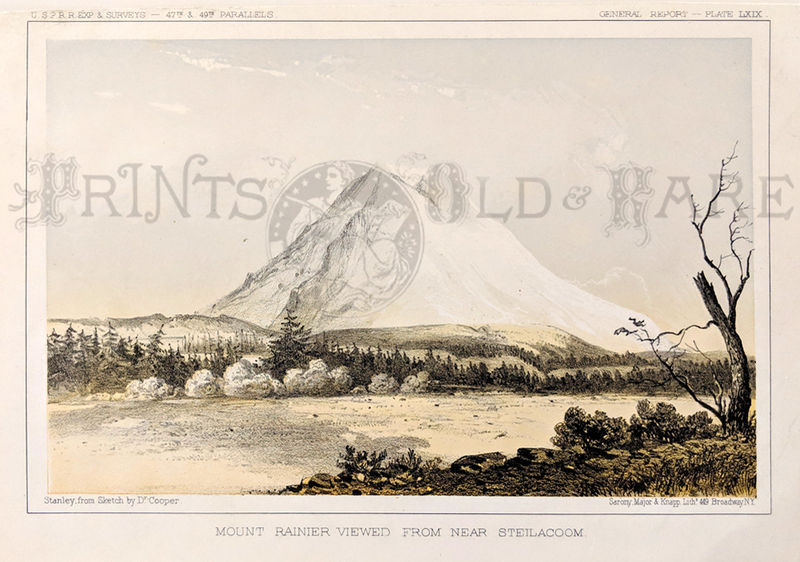 1855 Color lithograph titled, "Mount Rainier Viewed From Near Steilacoom." Sarony, Major & Knapp, Lithographers. Featured in the U.S.P.R.R. Expedition & Surveys. 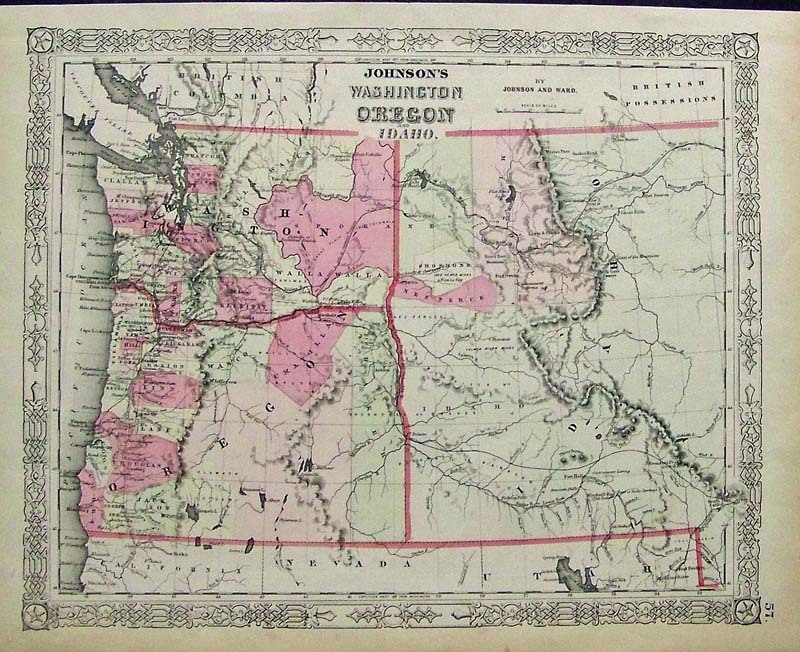 Rare Johnson's Washington and Oregon hand colored map showing each state outlined in red. Small burn marks are in outside border and one in Washington. 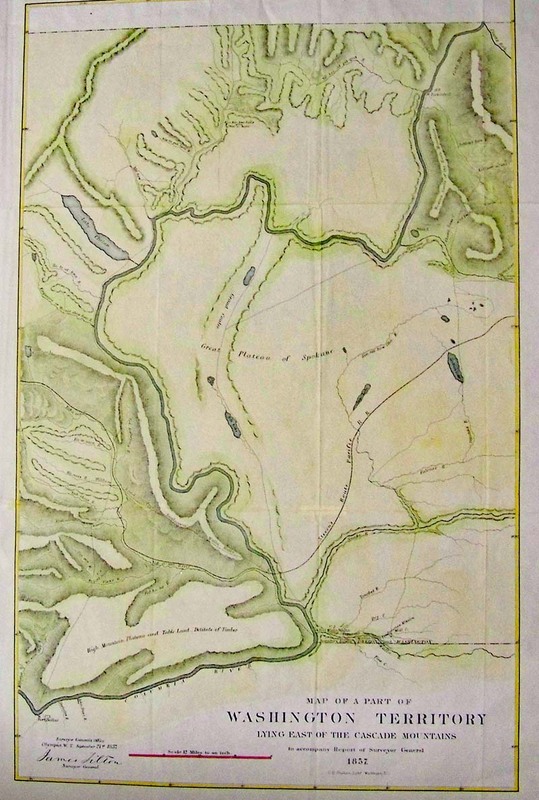 This very large, hand colored early survey map of Washington Territory was conducted under the the supervision of James Tilton, Surveyor General. 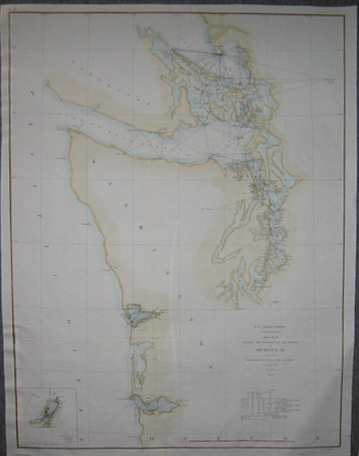 The Williamette Medidian from Portland to Puget Sound and the 4th Standard Parallel extending west to Gray's Harbor have been surveyed, but much of the rest of the cartographical information is speculative at best. 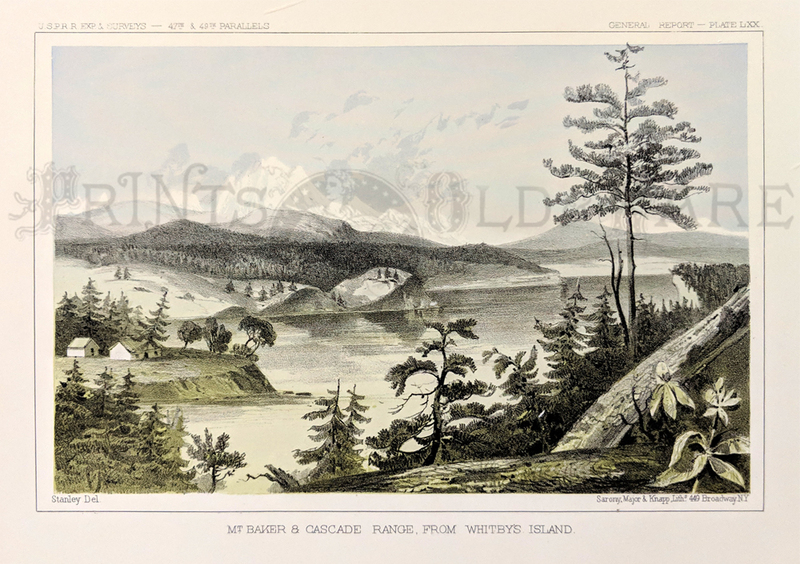 However, Wheat notes that the map is important in showing the Hudson's Bay Company's posts at Fort Okinakane and Fort Colville, along with the location of Lake Chelan, east of the Cascades. 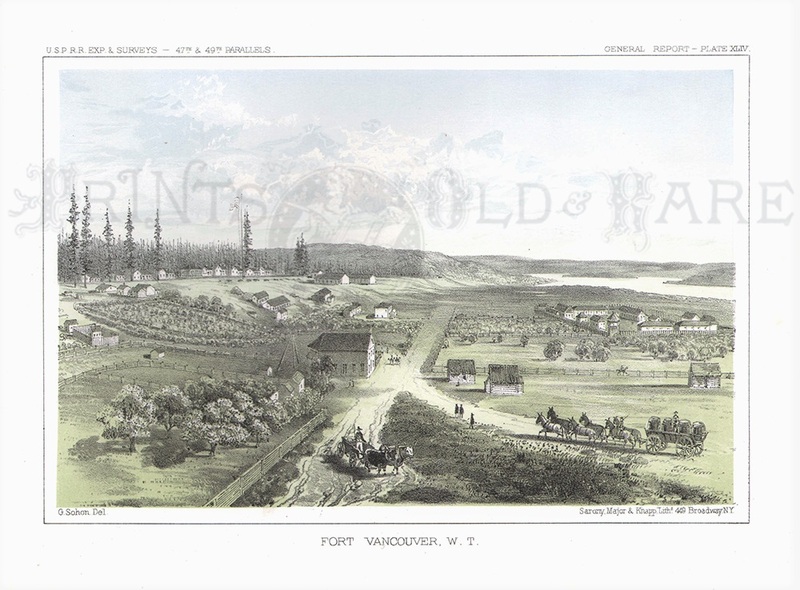 The U.S. Military Road from Ft. Steilacoom to Walla Walla is shown. The road proceeds from Seattle, up the White River, across Natchess Pass and down to Fort Walla Walla, by the valley of the Yakama River. 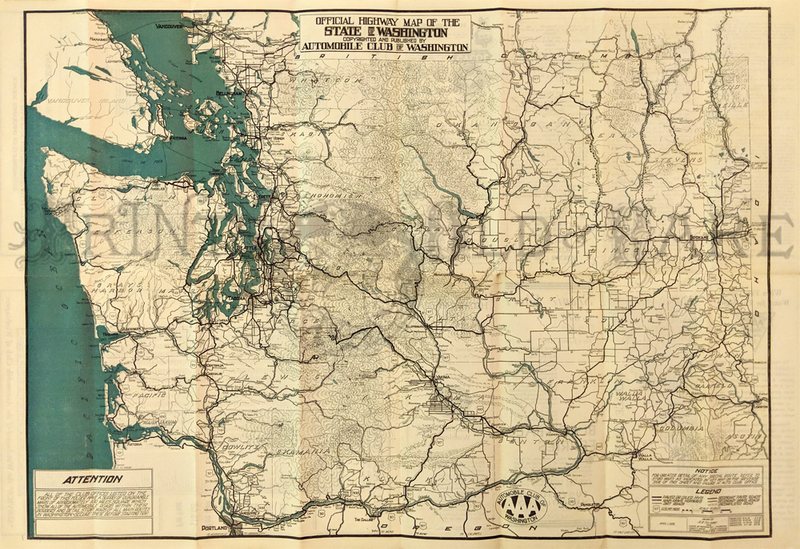 The map also shows Stevens Route for the Pacific R.R., coming up the Cedar River from Seattle, crossing over an unnamed pass south of Snoqualmoo Pass and proceeding down the Yakama River. Curiously, no surveys had been made or were yet contemplated through this region. 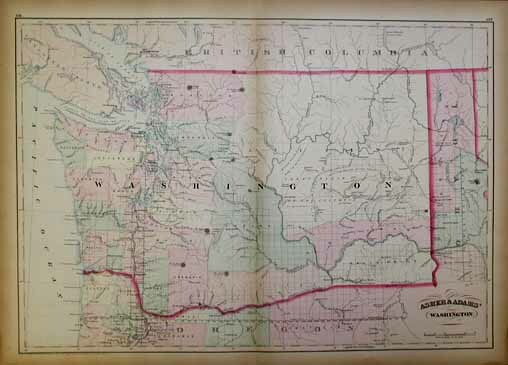 This is an extremely important map of the State of Washington as a territory and rare. Condition: Very fine wide margins, with three folds, some discoloration on top of folds not affecting image. 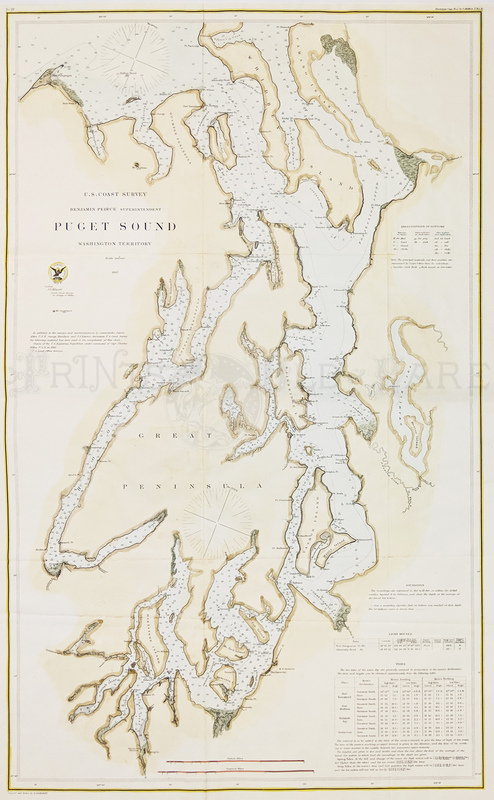 A beautifully hand colored Puget Sound Costal Chart published by U.S. Coast Survey in 1867. Showing light houses, water depths from Pt. Demock down to Olympia and tide chart for various ports and bays. 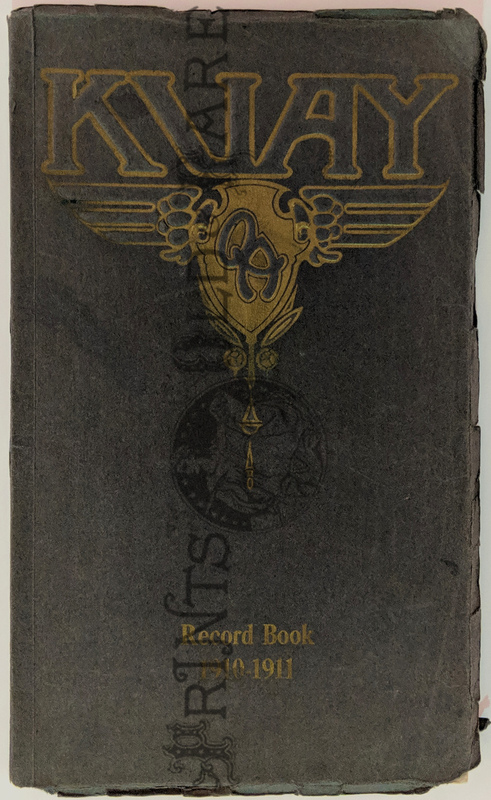 Queen Anne High School Yearbook. Seattle. 1910-1911 “Kuay” 98pp. This historic building now on the national register and has been turned into condos. Contains pictures of faculty, graduates, teams, ads. 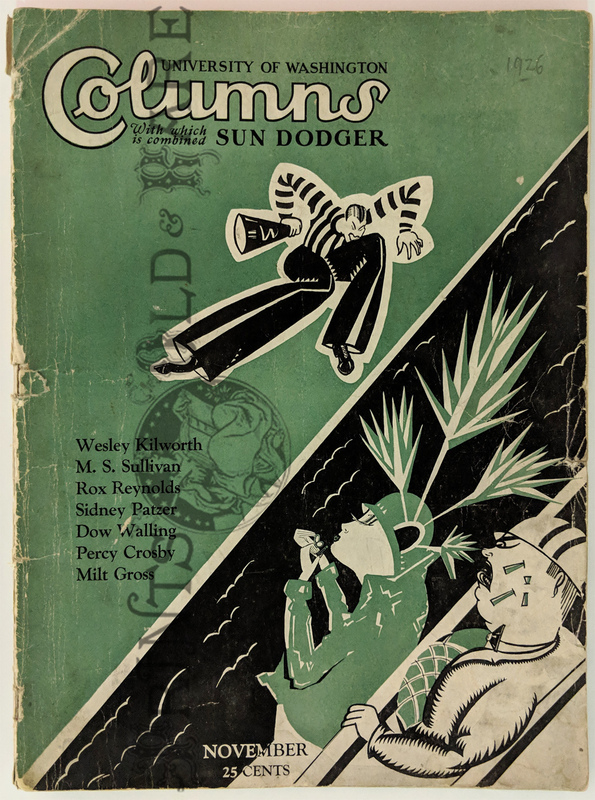 University of Washington Student Magazine 1926. “Columns” plus the Sun Dodger. (82pp pictorial covers.) Stories and articles by students including Sidney Patzer.